The coastal parish of Lessingham is situated in northeast Norfolk, just below Happisburgh. Its name comes from the Old English for ‘the homestead of Leofsige’s people’. People have lived in Lessingham for a long time and the parish was certainly well established by the time of the Norman Conquest, its population, land ownership and productive resources being detailed in the Domesday Book of 1086. The earliest evidence of human activity comes in the form of Palaeolithic flint handaxes (NHER 8342, 8343, 8369, 13397 and 40775) and a flint flake (NHER 8341). The only Mesolithic find to date is a chipped flint axehead (NHER 11401) that was ploughed up in 1976. Two Neolithic axeheads, one chipped (NHER 8344) and one polished (NHER 17101), have been found in the parish, as well as an unusual polished greenstone axehead (NHER 21649) that was turned up by a potato harvester in 1984. The Bronze Age is represented by some worked flint flakes (NHER 39381), although aerial photography has tentatively identified a ring ditch (the remains of a flattened circular burial mound) at NHER 38601. The only Iron Age find to date is a harness fitting, though again, aerial photographs have noted enclosures, a field system and a boundary ditch (NHER 38584, 38603 and 43635) that may be Iron Age or Roman. Evidence of Roman activity is relatively sparse at present. Finds currently consist of coins (NHER 8345, 35287 and 41337) and brooches (NHER 24214). The Saxon period has yielded fragments of pottery (NHER 24214 and 40237). The medieval period has left the parish with its oldest surviving buildings, its churches. All Saints’ (NHER 8248) is a small church, isolated in fields and reached by a narrow lane. It consists of a west tower, thatched nave, ruined chancel and a south porch. The basic structure is 13th century, with a 14th century belfry and porch, though the church was much rebuilt during a restoration of 1893. The chancel was left ruinous after a storm in October 1961, and has been walled off from the nave. Inside, the nave has a handsomely panelled roof, and there is a 13th century octagonal font on a modern base. The piscina is of about the same date, and both may have come from an earlier building. The little pulpit dates to around 1650. An important medieval rood screen depicting twelve saints is now held by the Norfolk Museums and Archaeology Service, though there is a photograph of it in the church. Prettily set in quiet countryside, St Andrew’s Church (NHER 8379) consists of a late 13th century chancel, with a largely 15th century nave, west tower and rather grand south porch. There is evidence that the already wide nave once had aisles which were later removed. The thatched roofs of the nave and chancel date from a restoration of 1878. Inside is a very fine and pleasing 15th century rood screen with a painted display of saints, one of which, St Eligious, the patron saint of farriers, was stolen in 1982 and never recovered. There is also a 15th century stone font with lions on its base, a fine early 17th century pulpit on legs and a reading desk of about the same date. Slightly out of place are three massive baroque bench ends that came from King's College Chapel in Cambridge. Action by the sea has taken its toll on St Mary's Church (NHER 8346), once serving the village of Eccles-next-the-Sea (NHER 8347). Both the church and the village were engulfed by the sea and abandoned probably in the 1570s, but the round west tower with its octagonal top remained standing until 1895, when it fell in a storm. The foundations of the building are usually concealed under sand, but are occasionally exposed by the tide. Burials in the old churchyard are also sometimes exposed, and various medieval objects have been found in the area. 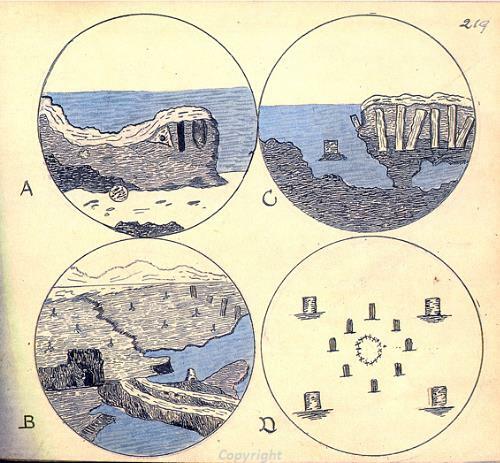 Of the village itself, tidal exposures, together with partial excavations, have revealed wells, structural foundations, a hollow way and stonework. Medieval objects have also been found. Some elements of these features are visible on aerial photographs, in particular those taken after the large tidal scour event in 1991. Another medieval building has not survived, but has left a footprint in the form of its surrounding moat. At Moat Farm are three remaining sides of a medieval moat (NHER 8245), now mostly tree covered. The eastern part of the moat is now covered with 19th century farm buildings. Selected post medieval buildings in the parish include Beach Farm Cottages (NHER 29181),a 16th or 17th century two storey brick and flint range of cottages, now a house. Viewed from the front, the left part with its projecting porch tower is the oldest, the right side being a later addition and a clear vertical line dividing the two. During a highly commended renovation in the early 1990s, various 19th century agricultural relics were discovered, and a board blocking a window was found to have graffiti of ships on it and a date 1776. Thatched cottages on Low Road (NHER 42619) is a 16th and 17th century thatched house, now divided into two. Its roof was destroyed by fire in 2005. Little Manor (NHER 36514) on Hempstead Road is a 17th to 18th century thatched brick cottage, much altered and extended, one storey high with dormer windows. Its end walls have massive shaped gables. Beach Farm (NHER 36513) is a farmhouse and associated buildings. The farmhouse is 18th century, L shaped in colourwashed brick. The three stead thatched brick barn is mid 18th century, even though it has a reset datestone of 1670. A further barn is timber with brick gable walls and is early 18th century. The thatched brick and flint stable block, which is mid 18th century, is now a garage. Church Farmhouse (NHER 44343) is a late 18th century two storey brick farmhouse with a black glazed pantile roof and a large rear extension. At the rear is a very good example of a late 18th century flint serpentine or crinkle crankle wall (NHER 30680). Other post medieval features can be made out from aerial photographs, for example water meadows (NHER 38556 and 38560) and possible fish-rearing ponds (NHER 43640). The landscape of the parish changed dramatically during World War Two with the construction of a huge network of anti-invasion structures along the Norfolk coast and at stop lines further inland. These included anti-tank cubes (e.g. NHER 38559), barbed wire enclosures (e.g. NHER 27269), gun emplacements (NHER 27333 and 27336) weapons pits (e.g. NHER 27326), training areas (e.g. NHER 27292), and anti-tank spigot mortar emplacements (e.g. NHER 27323). The enormous scale of these defences can be seen on aerial photographs taken just after the war, although the majority were later demolished and cleared away. 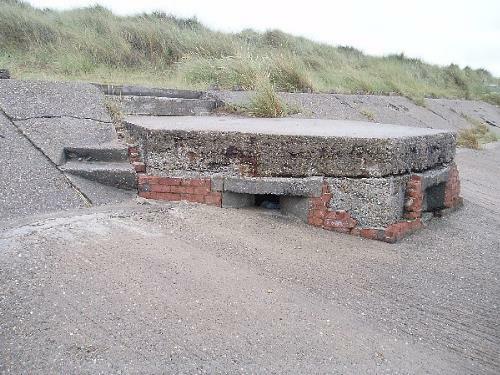 Some structures do survive, however, including pillboxes (NHER 32639, 32640, 32644, 25959 and 25960), and a rare heavy machine gun post (NHER 25958), now buried in sand dunes to the north of Castle Farm, Eccles-on-Sea. At the top of The Street is a type K6 square cast iron telephone box with a domed roof, made to a 1935 design by Sir Giles Gilbert Scott. Piet Aldridge (NLA), 19 October 2006.